The second major aspect of the dividend policy of a firm is the stability of dividends. The invest favor a stable dividend as much as they favour the payment of dividends (D/P ratio). The term dividend stability refers to the consistency or lack of variability in the stream dividends. In more precise terms it means that a certain minimum amount of dividend is paid regularly. 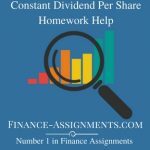 The stability of dividends can take any of the following three forms: (i) constant dividend per share, (ii) constant stable D/P ratio, and (iii) constant dividend per share plus external dividend.